Through an online group called Swap Mamas, I traded some baking ware to a total stranger through the mail in exchange for this costume when Rachel was just an infant. I've been holding on to it for about 2 years. She's tried it on just a few times but it gets hot and scratchy so she never really plays in it much. 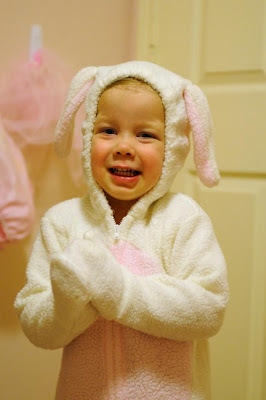 With summer here, it is way too hot to be hopping around in a bunny costume and she is close to out growing it at this point. 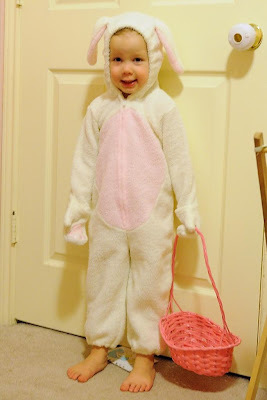 I'm afraid it is time to say "bye-bye" to the bunny costume and pass it along to another little girl. But before we did, I wanted to capture a few pictures of her in it because she makes a cute little bunny.